As international news channels report on the outcomes of the Supporting Syria and the Region conference, host venue the QEII Centre is reflecting on the intricate planning and logistics involved in bringing together leaders from more than 60 countries around the world, international organisations, business, civil society, Syrians and people affected by the conflict. The conference, on 4 February, was co-hosted by the UK, Germany, Kuwait and the United Nations and saw world leaders challenged to agree a comprehensive new approach on how we respond to what’s been labelled the world’s biggest humanitarian crisis, building on the 2014 Berlin Conference and the three Kuwait Pledging Conferences. They were tasked with raising significant new funding to help millions of people whose lives have been torn apart by the devastating civil war. The day opened with speeches by the co-hosts – who included David Cameron, UK Prime Minister and German Chancellor Angela Merkel – before plenary sessions were broken up with dynamic content in the form of films, video link-ups and speakers from NGOs and the private sector. A livestream enabled viewers to tune in to the conference online, in real-time, from anywhere in the world. Themes covered humanitarian, economic opportunities and jobs, inside Syria, including protection of civilians from harm, and education. Delegates in attendance included Nobel peace prize laureate Malala Yousafazai, Queen Rania Al Abdullah of Jordan, Ertharin Cousin, head of the UN’s World Food Programme, China’s foreign minister Wang Yi, Iranian foreign minister Mohammed Javad Zarif, UN Secretary General Ban Ki-moon and US Secretary of State John Kerry. 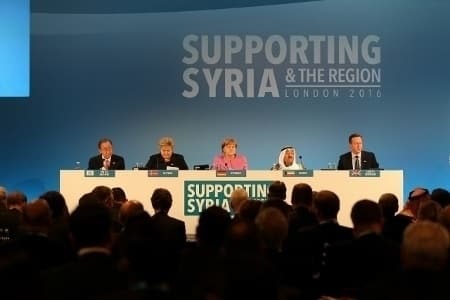 Security was of paramount importance at this third major international aid conference on Syria. It was the first conference to invite Syrian delegates to attend. The QEII Centre worked closely with the Met Police, government and other agencies ahead of the event. Road closures were put in place by 8pm on 3 February in the area surrounding the venue. This included all roads within the boundary of Buckingham Gate, Birdcage Walk, Broad Sanctuary and Victoria Street to the west side of Parliament Square. Helicopters hovered above London while the conference took place, with all roads re-opening by 6am on 5 February. The world’s media congregated at neighbouring Central Hall Westminster, following a pre-accreditation process in the months leading up to the conference. QEII Centre staff were also subject to strict security procedures. The 2016 UN inter-agency appeals for the Syria crisis are an estimated US$7.73 billion. An additional US$1.2 billion in funding is required by affected regional governments as part of national response plans. The conference closed with more than US$10 billion dollars in pledges, as well as commitments to support 1.7 million children in education and deliver 1.1 million jobs.